Fat Bruce Lee and I chose Cube Marketplace and Café as the burger du jour. It was a bit of a hike from our Century City fortress, but we found metered parking right out front. We chose Cube based on a glowing review over at Serious Eats and a bunch of gushing comments from Yelpers. After all, it is the mission of The BurgerBusters to sample such things so that you don't have to. Ready...Set...Terrible! Please keep your thumb out of my bun. The Beef: Conceptually, the beef was amazing. At Cube Marketplace and Café they ground hangar steak and rib meat to order, and then they loosely formed it into a 5-6 ounce, thick, uniformly shaped patty. This was a fantastic idea, and I certainly was looking forward to this, especially since I was informed that they only cooked this to Med-Rare due to the ingredients. That’s how I like my burgers, especially when they are composed of high-quality cuts of beef. The Preparation: Here is where the beef part of the dish went terribly, terribly wrong. They cooked my burger to a grayish Well Done. Granted, they got a great sear on it, but at what cost….at what cost? The dramatic overcooking of the small, thick patty did two especially awful things to my cheeseburger. 1.) It brought out an excessively gamy flavor in those perfectly aged cuts of quality beef. 2.) Because the beef was ground to order, and they ground it quite/overly finely, the beef released a fair amount of blood and fluid during the cooking process. That overcooking converted all that blood and fluid into a mealy pudding, which bound all of the bits of beef together. This, combined with the gamy flavor, resulted in a burger, which had the taste and texture of liver-flavored dog food. 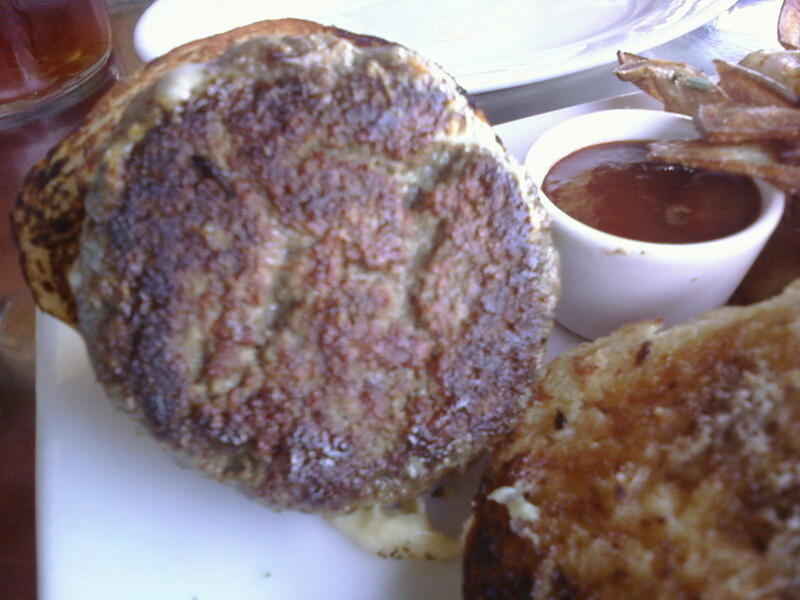 The Sear: Wow—a damn fine sear from a hot griddle—thick, crunchy, and completely wasted considering the fact that they murdered the patty by overcooking it. The Bun: They served the burger on a beautifully-toasted but dry and oddly mealy brioche, which was baked in house. The bun was conceptually great—baked in house for maximum freshness, perfect sizing, and quality control. Sadly, it was dry, and it had the texture of day-old focaccia. The Cheese: I ordered Cheddar with my burger, and I suppose it was fine, but the awful flavor and texture of the beef and the bun completely overwhelmed my palette. I have no recollection of the cheese. It was a White Cheddar, though. The Fries: They were clever. The fries were flat (ribbon cut) so they were nicely crisped, and they were well seasoned. They came out like french fry/potato chip hybrids. Sadly, the fries were the best thing on the plate. The chipotle ketchup added just the right amount of heat to this part of the dish. The Value: At $18, this was a pricey burger. It would have been a poor value even had it been excellent, because the portion was really quite small. In fairness, I ate only about a quarter (three bites) of this cheeseburger, and I sent the rest back. Cube did everything right from a service standpoint. They offered to refire the dish, but I really didn’t want to wait an additional 20 minutes and chance another inedible dish. 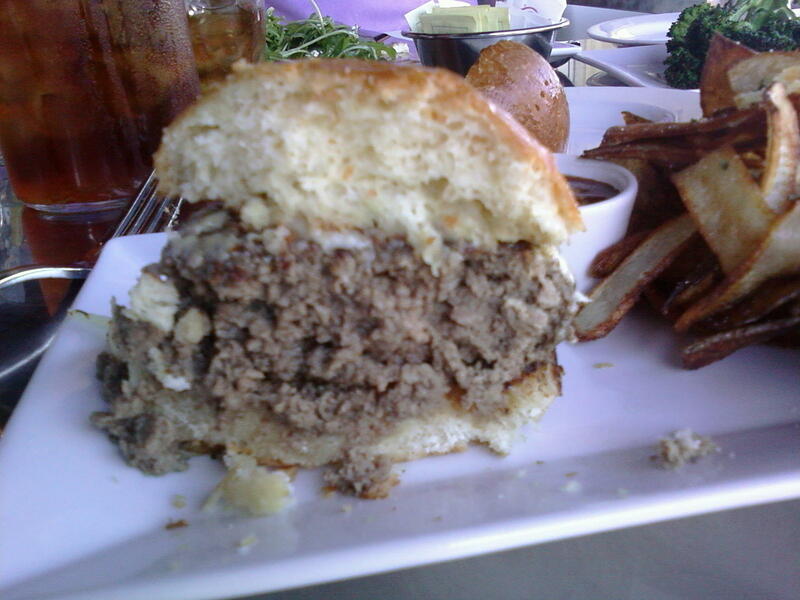 They did comp the burger and the side of charred broccoli that I stole from Fat Bruce Lee. The broccoli was delicious. The cheeseburger at Cube Marketplace and Café was a lot like the 2004 Lakers where Shaq, Kobe, Gary Payton, and Karl Malone couldn’t bring it home. All the ingredients were in place, but Cube just couldn’t make it work. 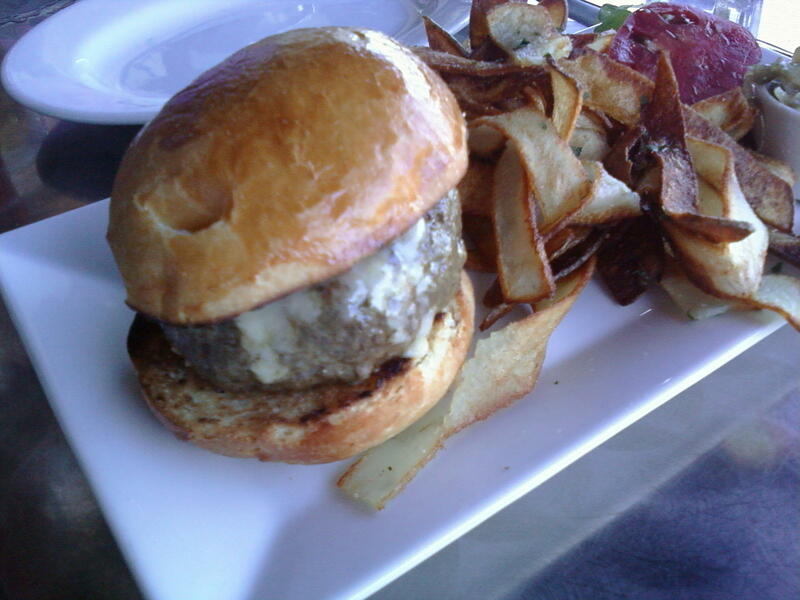 Burger Review : Overcooked, small, and way too expensive.